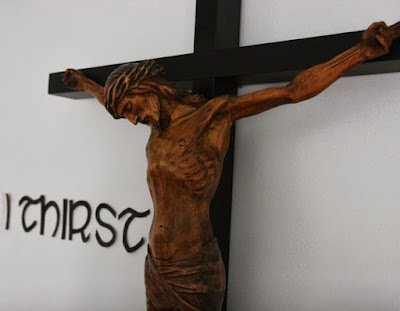 In the oratories of the Missionaries of Charity, the religious congregation founded by “Mother” St Teresa of Kolkata, you would see over the main crucifix two words “I thirst,” the last two words of our Lord on the cross before He expired. Many have wondered why she had chosen these words and sought to immortalise them in her chapel. Mother often said it was because Jesus was thirsting for souls. But, it seemed in her countenance every morning, that Mother was the thirsty one, like the Samaritan woman in today’s gospel, thirsting for the only One who could quench her thirst and offer her the life-giving Water of Life. Today, as we celebrate the First Scrutiny for our Elect, let us consider the experience of the Samaritan woman as she moved from incredulity to faith. According to St Augustine, the Samaritan woman is a symbol of the Church, “She is a symbol of the Church not yet made righteous. Righteousness follows from the conversation.” In our Lord’s conversation with the Samaritan woman we can hear, as St Augustine observes, one of Christ’s most attractive and tender invitations: “Come to me, all you who labour and find life burdensome, and I will give you rest” (Mt 11:28). This invitation never fails to touch our hearts, because there is not one among us who does not find life heavy and burdensome from time to time. But it is also supposed to change our hearts—in the same way that it changed the Samaritan woman. The invitation itself provokes the discovery that only in Jesus does our soul find rest, that only in Him is our hunger and thirst for love satisfied: “In God alone be at rest my soul” (Ps 62:1). Thus, the Samaritan woman epitomises the deep thirst that all of us are born with. Like her we thirst for something we cannot immediately identify. We cannot give it a name. And like her, we must learn that nothing will satisfy it except the One for whom the thirst was made. St Josemaria Escrivas tells us that, in fact, our Lord “encourages” this feeling of emptiness in us, so that “our hunger and thirst will increase to the point that we desire God really to inhabit our soul and never to take His light and warmth away from us.” Our Lord’s desire for us is that we have life and have it more abundantly. This means in union with Him always. Thirst of the body is not quenched all at once, nor is the thirst of the spirit. Our cistern is very, very deep. Our Lord wants us to realise that our thirst for Him, our need for Him, is permanent. There will never come a day when we do not need Christ to save us from something, to console us, to enlighten us, to refresh us, to challenge us: “Apart from me you can do nothing” (Jn 15:5). The Samaritan woman wanted something that she could not identify. If you asked her why she had come to the well, she would have answered with the same kind of abruptness that she initially used to address our Lord in conversation: “Isn’t it obvious? I have come for water.” But there is a Stranger sitting at the well who sees right through her, unmasks her desire—which is for the eternal. And our Lord helps her to give it a name: “I who am speaking to you, I am He” (cf. Jn 4:26). She had come to the well seeking life-quenching, life-sustaining water. Our Lord offered her something better. He offered her what no one else or nothing else could - living water that sustains life eternally. No rope or leather bucket or pipe or tap was necessary for His promised water. He alone supplies the gift. In Christ, we come to recognise our thirst for Him. And not only do we need help to recognise our own thirst, we need help to see those around us who are thirsty. It is not just to the poor, the physically hungry, the stranger in our land who needs to be quenched, but also the spiritually destitute. The recognition of this thirst is what impels us to share the life-giving Word with others. Thus the story provides us with a beautiful model of evangelisation. First, the Saviour meets us where we are. Our Lord came without condemnation and judgment but recognised her deep longing, her thirst and hunger. He pursued this otherwise unacceptable relationship, a woman who thirsted for love and acceptance and found none satisfying. He pursued this woman, who was rejected not only by the Jews but by her own people. He began to woo her for His own because He meant to have her in heaven. This is because “God did not send His Son into the world to condemn the world, but in order that the World might be saved through Him” (John 3:17). Likewise, the salvation of souls should be our ultimate concern. We should not just “preach to the choir” but reach out generously and lovingly to those who are unconvinced. We should reach out not only to the good, the righteous, the responsive, but also to those who are seemingly wicked, sinful and even dismissive of the message we bring. Secondly, the Saviour helps us to see our weaknesses. Once we see the Lord’s offer of a priceless gift that endures forever, we can face sins, shortcomings, and weaknesses that prevent us from wholly partaking of His offer. The call to drink from the Font of Living Water must be accompanied by the call to repentance. A gospel that excludes the call to repentance is a false gospel. The gospel of nice which avoids calling out sin eventually does greater injustice to the sinner. It serves as a comforting echo chamber but brings us nowhere closer to the source of eternal life. Our intention is not to shame but to liberate. We are motivated by love, not hate. Thirdly, the Saviour leads us to recognise Him. There is no way we can offer others the water of life, if we fail to name its source. Christ is the Way, the Truth and the Life. And if we are embarrassed to proclaim this, then we are denying others the right to that life-giving, life-liberating, life-resurrecting truth. Finally, we should not just merely consider our own thirst and the thirst of others. We should also think about the Lord’s. When we look at the crucifix, it is good to remember what Mother Teresa wanted her nuns to remember, the Lord’s words: I thirst. What specifically is Jesus thirsting for in us? He longs for our love, our attention, our devotion, the total entrusting of our lives to Him. He is thirsty for our salvation, thirsty for our faith and our love. God is thirsting for us to come forward to satiate His thirst by giving Him our love and by spreading the love of His heart to others who need to be quenched too. God is thirsty for souls and so should we. Lent is a time for us to quench our thirst and that of others. This is a special time to encounter our Lord like the Samaritan woman, and to be transformed by our encounter with Him, like she was. The Lord wants to give us living water, His life in abundance. Sin is an obstacle to that full life in Christ, so we have this time of Lent for our deeper conversion to the Lord. The Church invites us to drink from the living waters of the Holy Spirit. Then, like the Samaritan woman, we are no longer thirsty. In fact, we are transformed into missionary disciples, who go forth to bring the Good News to others; like the Samaritan woman did and like Mother Teresa did, going forth then to spread the love of Christ and remind those who are thirsting, that there is only One who says to us, “I Thirst (for you)”.